One could state that the aim of wellbeing has long been implicitly present in architecture and interior architecture but is now emerging, maybe not yet as an explicit design approach but at least as an explicit goal of research within these domains. Generating knowledge on ways in which the built environment can contribute to the subjective wellbeing of its residents, however, entails the merging of expertise from fields that are quite distinct. Although researching the possible interactions of the physical environment (architecture and interior architecture) and more subjective, human-related aspects (social and behavioural sciences) is of course hardly a novel paradigm in itself, the practical, methodological and epistemological properties commonly associated with these two fields can be very different and the new research domain of “designing for subjective wellbeing” tends to push these differences to their extremes. 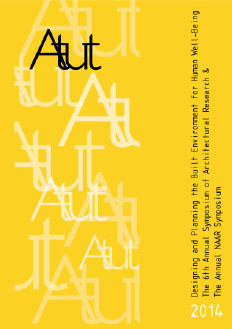 In this contribution, I provide a personal account, from the perspective of a researcher in (interior) architecture with a background in psychology, of what I consider apparent, less apparent but sometimes also illusionary differences between these two fields of expertise and how these impact our ongoing process to establish and develop a research program on ‘Designing for More’. Castelfranchi, C. 2004. "Reasons to believe: cognitive models of beliefs change." ISTC-CNR, Roma–Workshop Changing Minds, ILLC Amsterdam. Cross, N. 2006. Designerly ways of knowing. London: Springer. De Botton, A. 2006. The architecture of happiness. London: Hamish Hamilton. Desmet, P., Pohlmeyer, A. 2013, “Positive design: An introduction to Design for Subjective Well-being”, International Journal of Design, Vol. 7, No. 3, pp. 5-19. Diener, E. 1984. “Subjective well-being”, Psychological Bulletin, Vol. 95, pp. 542–575. Ellis, C., Adams, T.E. & Bochner, A.P. 2010. ”Autoethnography: An Overview”, Forum Qualitative Sozialforschung / Forum: Qualitative Social Research, Vol. 12, No. 1. Available through http://www.qualitative-research.net/index.php/fqs/article/view/1589/3095 [Accessed 12 September 2014]. Gilbert, D. 2012. "The science behind the smile. Interview by Gardiner Morse", Harvard business review Vol. 90,.No. 1-2, pp. 84-90. Herssens, J. 2011. Designing Architecture for More. A Framework of Haptic Design Parameters with the Experience of People Born Blind. Ph. D. Hasselt University & University of Leuven. Holt, J. 2006. Oh, joy [Review of the book Happiness: A history]. The New York Times, [online] 12 February. Available through http://www.nytimes.com/2006/02/12/books/review/12holt.html [Accessed 12 September 2014]. Hujala A., Rissanen, S. & Vihma, S. eds., 2013. Designing wellbeing in elderly care homes. Helsinki: Aalto University. Kesebir, P. & Diener, E. 2008. “In Pursuit of Happiness: Empirical Answers to Philosophical Questions”, Perspectives on Psychological Science, Vol. 3, pp. 117-125. Kopec, D. 2006. Environmental Psychology for Design. New York: Fairchild Publications, Inc.
Quartier, K., Vanrie, J. & Van Cleempoel, K. 2014. “As real as it gets: What role does lighting have on consumer's perception of atmosphere, emotions and behaviour?”, Journal of Environmental Psychology, Vol. 39, pp. 32-39. Schön, D.A. 1983. The Reflective Practitioner: How Professionals Think in Action. New York: Basic. Van de Weijer, M., Van Cleempoel, K. & Heynen, H. 2014. ”Positioning Research and Design in Academia and Practice: A Contribution to a Continuing Debate”, Design Issues, Vol. 30, No. 2, pp. 14-29. Wernick, J. ed., 2008. Building Happiness. Architecture to Make You Smile. London: Black Dog.